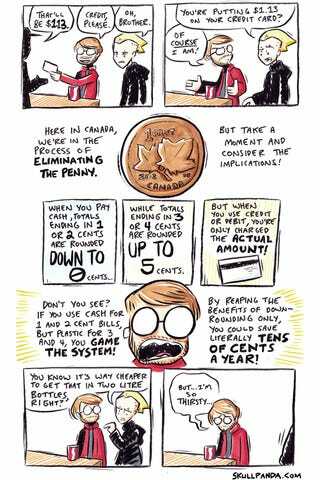 Canada is in the process of phasing out their penny (after which it will be executed for high treason, as I understand). But their rounding scheme (round down if the "cents" portion of the total ends in a 1 or 2, round up if it ends in a 3 or 4 . . . but charge the exact amount if a debit/credit card is used) can be exploited for wanton financial gain.